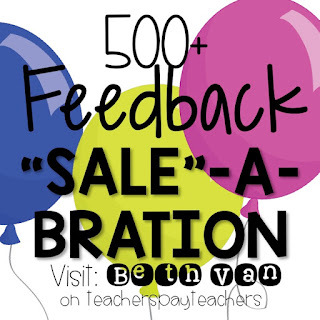 I want to celebrate by having a sale in my teacherspayteachers shop. I recently hit a few milestones and wanted to say "THANK YOU!" by throwing a little sale. This teacherspayteachers journey has been oh so wonderful and I'm so grateful for the connections I've made with so many awesome educators and teacher bloggers! The support and kindness is immeasureable and I'm so glad that I get to share my ideas with phenomenal teachers. It's fun. It's wonderful. And it's only going to get better! Be sure to stop by my store and check things out or my instagram to say hooray! Have a great week y'all!